The lowdown: Mezcal is the umbrella name given to liquor distilled from any species of agave plants native to Mexico. Tequila is a type of mezcal distilled from the blue agave, though in practical terms they are two distinct products. While tequila has long been a major export and source of pride for Mexico, many Mexicans before the late ’90s considered mezcal lowbrow swill, only enjoyed by backwater farmers and reckless tourists. But in the past 20 years, that image has changed—dedicated distributors, artisans, and smart marketing have elevated this liquor worldwide into something more refined. No one knows for sure when mezcal was created, but on the conservative end of estimates it’s around 500 years old. Traditional scholarship assumes European invaders led by Cortes saw the Aztecs drinking pulque, the naturally fermented drink made from the agave plant (still somewhat popular in Mexico despite being highly perishable), and using European methods, figured out how to distill it into a more stable and powerful elixir. The recently published book The Mezcal Rush by Granville Greene details how new research throws this assumption into question. Ancient pottery shards originally believed to be used for cooking beans may have actually been an ancient still, which would mean mezcal could predate the arrival of colonialists in Mexico. Whether its lineage is 500 years or 5,000, the smoky, sweet, floral flavors of artisanal mezcal are a low-tech time machine. That’s in large part because it’s generally made in small-scale palenques (distillery) using technology and techniques that haven’t changed much in centuries. The first step in making mezcal is roasting agave in a pit in the ground, covered in dirt. The cooked agave is crushed on a stone mill—with artisanal mezcal, the mill is usually pulled by a donkey. All of this is carried out in small, rural facilities by maestro mezcaleros, who often have generations of family tradition to their name. On the other hand, most tequila is made in modern industrial factories (as is some low-end mezcal—you can pick these out by looking for a worm in the bottle). Artisanal mezcal brands usually don’t make their mezcal. 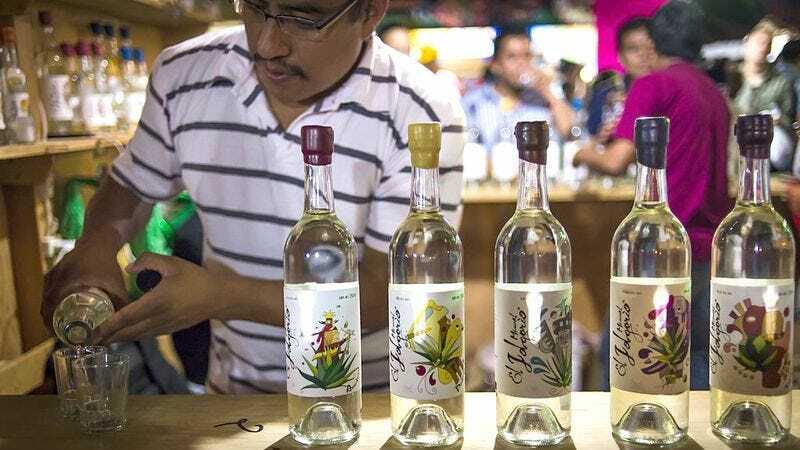 Following the example pioneered by Del Maguey in the 1990s, mezcal brands scour Mexican villages for skilled maestro mezcaleros and buy their mezcal in bulk, which they blend and bottle to their taste. The taste: The strongest flavor in mezcal is often smoke. And while there is plenty to enjoy in that flavor profile, an overpowering smokiness can be a sign of low quality. After all, smoke can cover a multitude of distilling sins, which can mean a larger profit margin for some of the larger industrial mezcal producers. With a liquor that is often around 50 percent alcohol by volume, an unscrupulous producer could add liquid smoke to Everclear, drown a worm in the bottle, and call it a day. Fortunately, that literal scenario doesn’t actually happen anymore since mezcal operates under a designation of origin, like champagne, that regulates its production. Still, industrial producers are inventive in finding ways to cut corners. Traditional or “single village” mezcal often highlights the flavor of the plant, so a sip can sometimes have a grassy or fruity flavor backed up with a peaty kind of taste—similar to a single malt whisky such as Laphroaig. Like wine, the soil and growing conditions of the agave can influence the drink’s flavor, allowing mezcal drinkers to seriously consider the terroir of a batch. Some more experimental brands are aging mezcal in barrels that previously held different liquors or wines, while others are adding ingredients like roasted corn to evoke the flavor of an elote. Possible gateway: If you’ve never had mezcal, you could start with one of the very low-end, worm-in-the-bottle smoke bombs if you like, but I’d recommend pretending that legacy doesn’t exist and go straight for the good stuff. There are 10 different brands of good joven (or unaged, and therefore clear) mezcals made from espadin agave available in my local spirits seller in Chicago ranging from $42 to around $75 per 750-milliliter bottle. The cheapest of these bottles is El Buho. If you’ve seen mezcal behind a trendy bar in the past few years, this is the the chunky bottle with an owl on it. For around $40, it’s a good entry point to appreciating mezcal. Smoke still dominates the flavor, but there are hints of sweet tropical fruit plus salt and pepper that point toward the broader spectrum of flavor a maestro mezcalero can coax from agave using traditional techniques. For a slightly more nuanced experience, try Alipus Santa Ana Del Rio (around $55 a bottle). With almost no smoke flavor, the vegetal agave is front and center. When I sip this variety, I’m transported to a sunny spring day on a grassy hillside. The Alipus brand says its mission is to preserve the traditionally small and rustic production style commonly found in tiny Mexican villages. They say that means living with smaller profit margins to ensure traditional mezcal production can provide a lucrative future to the children of maestro mezcaleros. Once you can appreciate the flavors of agave in a good mezcal, then it’s time to try something more experimental—such as Mezcal Vago Elote, a quality joven mezcal with infused toasted corn. In this case, the toasted corn is very subtle, integrating its sweetness seamlessly into the layered yet clean flavor profile. The trick is that after infusing the corn, the mezcal is distilled a third time by maestro mezcalero Aquilino García López. I know his name because Mezcal Vago prints all sorts of interesting production notes on their labels, including the village (Candelaria Yegolé in Oaxaca), type of still used (copper), and batch size (1005 liters). Next steps: You could go straight from the joven mezcal to the resposado or añejo variety, but first I recommend branching out to different types of agaves. Agave silvestre is a term generally applied to wild agaves harvested by hand from hillsides in Oaxaca, adding an additional layer of sweat equity to the process. Tobala is probably the most well-known of the wild agaves. Although it’s common to find different agaves blended in a single mezcal, Del Maguey Tobala is not—offering an unadulterated experience, said to be floral, fruity, and refined. My next step with mezcal will be to try a pechuga mezcal. This traditional style suspends a piece of meat (usually chicken or turkey) in the still as the mezcal is made. There is often a collection of fruits and spices added for good measure. Although I’ve never tasted this variety, folks who have tell me it’s funky and pretty unforgettable. The bottles I’ve seen of it were $89 and $230, so I guess it would have to be.